Adams Media Corporation, 9781440509834, 185pp. 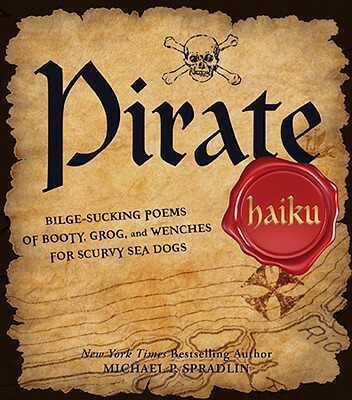 Come sail the seven seas aboard the notorious Black Thunder " Landlubbers have a first-mate seat to the grizzly life of eighteenth-century pirates--as told by the surprisingly poetic if salty One One-Leg Sterling. "Shiver me timbers," never before have we poppets been privy to the gritty goings-on of the rum-running, treasure-thieving, marauding masters of the open sea from the inside out. . . until now From trading rum for buxom beauties to fighting those limey British bastards, this book reveals the swaggering derring-do of these plundering and treacherous buccaneers--17 syllables at a time. Michael P. Spradlin is the author of several books for children. He is the author of "It's Beginning to Look a Lot Like Zombies; The Youngest Templar: Keeper of the Grail;" the novel series, "Spy Goddess," for which the first novel "Spy Goddess: Live and Let Shop" was nominated for a 2006 Edgar Award. His website is www.michaelspradlin.com.